The Turkey Day Run & Gobble Wobble has been a Charleston running tradition for 38 years. This is also one of the largest Thanksgiving runs in the area (and the 28th largest 5k in the country, according to the race website!). What a better way to see the beautiful historic streets of Charleston than to run them on Thanksgiving morning?! 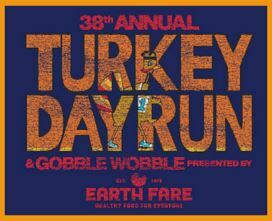 The annual Turkey Day Run & Gobble Wobble is a holiday tradition for Charleston natives and travelers alike. The largest 5K in Charleston kicks off at 9 a.m. at Marion Square in Downtown Charleston. The course takes participants through historic downtown Charleston and Battery before returning to Marion Square for a post-race party that includes free food and beverages (beer provided for those 21+ years) as well as live music and awards ceremony. A Children’s Fun Run and activities ensure that this is a fun event for any age. Presented by the Knights of Columbus, Rev. P.N. Lynch, Council 704, the purpose of the race is to raise funds for local charities. Past recipients of charitable donations include Alzheimer’s Association, Boy Scouts of America (Lowcountry chapter) and Crisis Ministries. The Knights of Columbus is a Catholic fraternal service organization. The Turkey Day Run had another record year in 2014, registering 7,535 runners and walkers and with 6,851 crossing the finish line. Cash prizes are awarded to the top three male and female finishers and first-place finishers in the Master and Grand Master categories.